The photograph to the right is remarkable in several ways. Taken in the 1880s or ’90s, it shows a Native American man named Cheshiahud (also known as “Indian John,” “Lake Union John,” or “Chodups”) and his wife Tleebuleetsa (also known as Madeline) outside of their home in Portage Bay, at the northeast end of Lake Union. Madeliine is cooking outdoors while her husband carves a dugout canoe: activities typical of Native American life for millenniums. But this scene is an anachronism; it took place within earshot of chugging locomotives, whirring sawmill blades and the clanging bell of an electric streetcar, at a time when Native Americans were forbidden to live in Seattle unless employed and housed by Whites. How did this couple come to be here, living a traditional, independent lifestyle, in spite of drastic changes all around them? 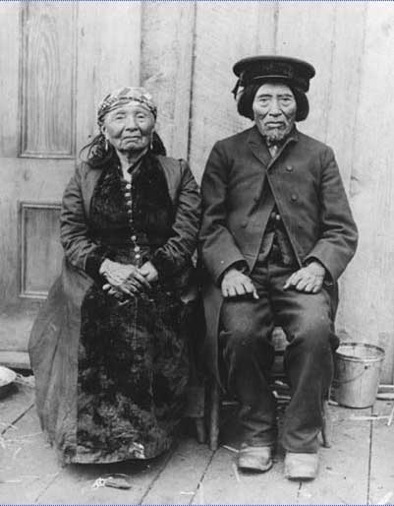 Cheshiahud was born about 1820 in a Duwamish village on Ha-Chu (Lake Washington), just over a mile from the spot where he would spend his last years with Madeline. In his childhood, only a few White explorers and traders had visited the Puget Sound area. 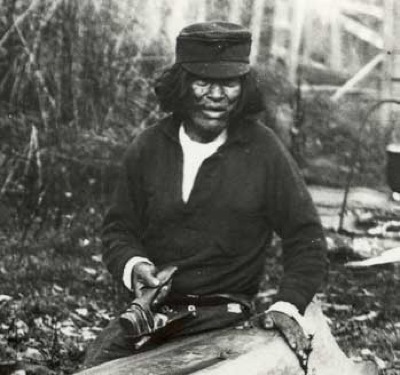 When the first White settlers arrived in the 1850s, Duwamish people helped the Whites get a foothold by sharing their knowledge of the land and working in the newcomers’ sawmills. Before long, troubles arose between Whites and Natives. In 1853, a man named James McCormick was reported missing. When a white man’s body was found buried on the shore of Lake Union the next Spring, it was assumed to be McCormick’s. Sheriff Carson Boren arrested three Native American suspects for murder. Two of these were grabbed by a lynch mob and hanged. The third was narrowly rescued from the mob by Boren and was later found innocent in court. This third Native was Cheshiahud. Despite this incident, or perhaps because of it, Cheshiahud remained friendly to Whites for the rest of his life. In 1855 tension between Whites and Natives came to a head over the Point Elliot Treaty, which compelled Native Americans to move to reservations. Anger over this treaty resulted in a brief Indian War. 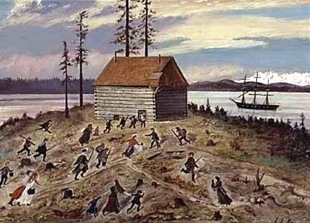 When tribes from the south and east arrived to attack Seattle, members of the Duwamish tribe warned settlers just in time for them to flee into several blockhouses. Many Duwamish, including Cheshiahud, took refuge with Whites in the town as the US warship Decatur shelled Natives in the surrounding hills. 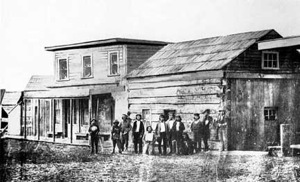 Despite all the help they had gotten from the Duwamish, the settlers decided to prohibit Native Americans from living in Seattle when the settlement was incorporated as a city in 1865. Only Natives working for Whites and living in quarters owned by Whites were permitted to remain. Not all Whites agreed with this banishment, however, and the edict was inconsistently enforced. 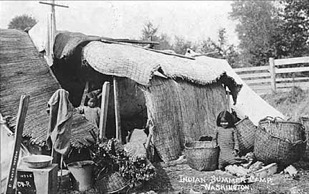 In some areas, Natives were shot on sight; in others, they were allowed to remain living in camps and cabins. 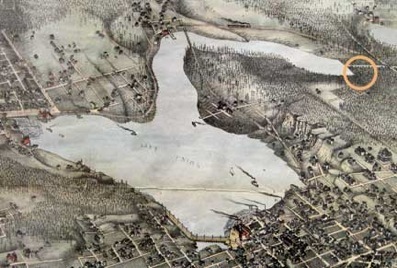 in 1866 the Duwamish tried to establish a reservation at the south end of Lake Washington, but Seattleites did not want Natives living so close to the city. So most of the Duwamish, including Chief Seattle, moved across Puget Sound to a reservation of the Suquamish tribe called Port Madison. Others scattered to the reservations of the Muckleshoot, Snoqualmie, Tulalip and Lummi peoples. 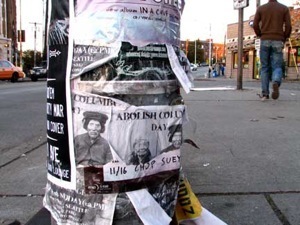 Within a few years their identity as Duwamish began to fade. Cheshiahud chose a different path. 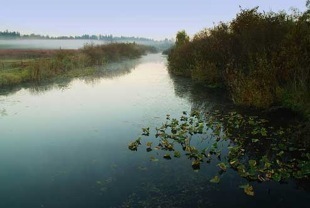 He moved instead into a remote swamp south of Bellevue, now known as Mercer Slough. He lived here in the 1870s with his wife Sbeilddot, also known as Lucy Annie, raising their daughter Jennie. According to a Seattle Post-Intelligencer article of 1906, Cheshiahud also had a son named Steve. About 1885 Lucy Annie died and Cheshiahud decided to move closer to his birthplace. Having befriended David Denny, one of Seattle’s original pioneers and largest landowners, he bought (or was given) a plot of land in Portage Bay. 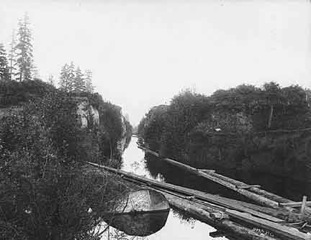 Right next to Cheshiahud’s plot, Denny was cutting a small canal from Portage Bay to Lake Washington so he could float logs all the way from the big lake to his sawmill at the other end of Lake Union. South Lake Union, 1903. Cheshiahud & Madeline still lived in their cabin at the other end of the lake. David Denny was one of Seattle’s most progressive founders. 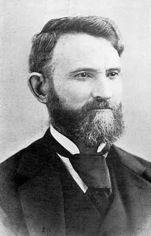 He was an early advocate of women’s suffrage and learned to communicate with Native Americans in their own languages. To make ends meet, Cheshiahud’s daughter Jennie went to work in the homes of David Denny and other leading Seattle families. 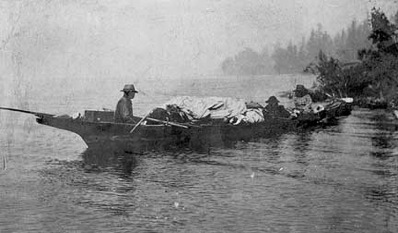 Cheshiahud himself found employment as a canoe guide for parties of Whites who wanted to explore Lakes Union, Washington and Sammamish. From one of these parties he received the unfortunate nickname of Chodups or “Flea” after the group camped in a buggy area. Apparently it was the campers and not their guide who chose the camping spot, so the unflattering nickname seems unfairly bestowed. 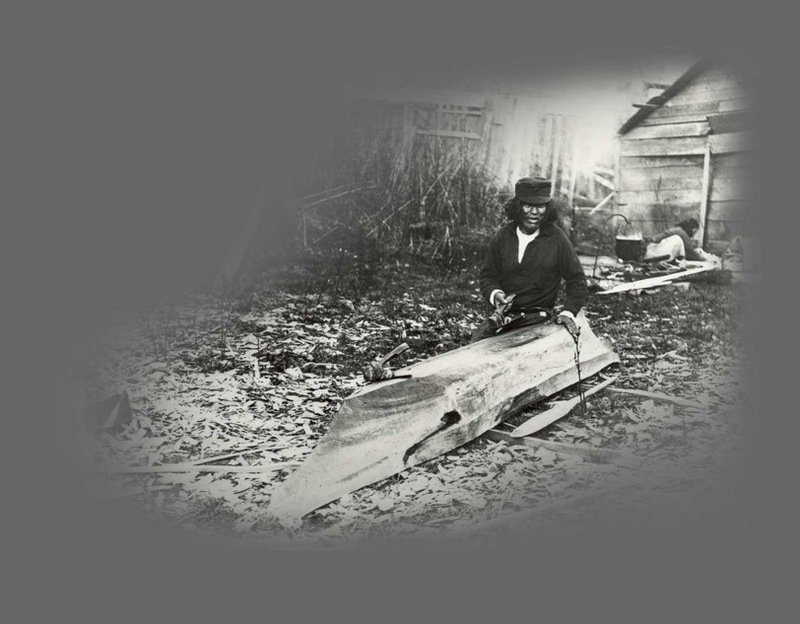 Cheshiahud also carved canoes for David Denny and others. In 2008 one of his canoes was on display at the Seattle Art Museum, along with works by renowned American artists including John Singleton Copley and Andy Warhol. At first Cheshiahud enjoyed the company of some Native Americans, including a his new wife Madeline and a nearby neighbor named Dzakwoos or “Indian Jim Zackuse.” His cabin became a popular stopping place for Native people traveling to and from Seattle from the reservations. Cheshiahud also lost a good friend in 1903 when David Denny died. Fortunately, Denny’s nephew Orion (the first White male child born in Seattle) carried on his uncle’s friendship. Orion took the most well-known photograph of Cheshiahud and Madeline (right). The final blow to Cheshiahud’s happiness came when Madeline became terminally ill in 1906. He sold part of his land and used the money to throw a three-day going away party for his wife. Relatives and friends flocked from around Puget Sound for a vigil so remarkable that it warranted a front page story in the Seattle Post-Intelligencer. 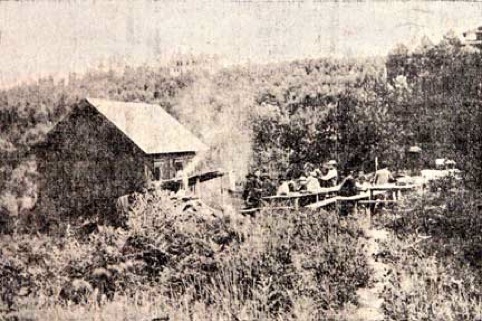 In the grainy newspaper photo at right, Cheshiahud’s guests can be seen eating at plank tables he built in his yard for the event. One of the University of Washington’s brand new buildings can be seen faintly on the horizon. 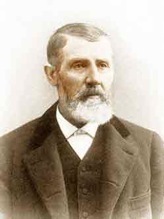 After Madeline’s death, Cheshiahud sold the rest of his land and went to live with Jennie at Port Madison, where he died in 1910. 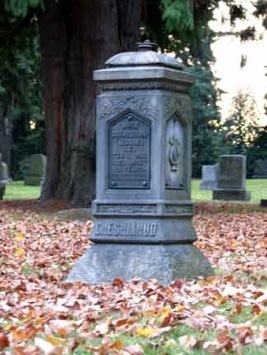 He is buried in Evergreen-Washelli Cemetery in North Seattle, next to his first wife Lucy Annie. Cemeteries in Seattle were strictly segregated at that time, but the influence of the Denny family earned him a place right next to the grave of Seattle Mayor Hiram Gill. Today, Cheshiahud’s magnificent tombstone stands as he stood in life: defiant, proud and alone in the midst of a strange and difficult people he found the courage and character to befriend. Thrush, Coll. 2007. Native Seattle. Seattle & London: University of Washington Press. Bass, Sophie Frye. 1937. Pig Tail Days in Old Seattle. Seattle: Metropolitan Press.